Take a gander at the government's economic report cards and one thing becomes readily apparent: an almost virtual absence of inter-provincial comparisons. There's a good reason for that. Compared to Alberta, Ontario and Quebec, B.C. doesn't always stack up so well. 'Tis the season of lists and stocking stuffers of economic forecasts. But instead of soothsaying over what could happen in 2016, a look back at B.C. 's economic performance over the past few years might be more illuminating. Deciphering	economic forecasts is a murky task anyways, not that interpreting statistics is any less risky. Consider the reaction of Minister of Natural Gas Development Rich Coleman to a recent report by the Canadian Centre for Policy Alternatives: "There's two things I don't believe anymore. Polls, and anything written by the Canadian Centre for Policy Alternatives." So, to avoid the "my stat is better than your stat" taunt, we'll default to some of the B.C. government's preferred statistical sources. Coleman shouldn't take issue with Statistics Canada, RBC Economics or B.C. Stats served straight up. Particularly the latter -- Minister of Technology, Innovation and Citizens' Services Amrik Virk is in charge of that one. Take a gander at the government's economic report cards and one thing becomes readily apparent: an almost virtual absence of inter-provincial comparisons. There's a good reason for that. Compared to Alberta, Ontario and Quebec, B.C. doesn't always stack up so well when it comes to job creation, economic expansion, exports, or investments. On the jobs front, that's her baseline. The latest numbers from Statistics Canada are for November 2015, 58 months in all. In that time, B.C. has created 82,900 new jobs. Alberta created 222,000, Ontario created 245,600 and Quebec created 131,900. It works out to about 17,150 jobs on average per year, a little more than half the number (33,800) B.C. created annually between 2001 and 2010. In 2011, B.C. 's unemployment rate was 8.8 per cent. Last month, it was 6.2 per cent, the lowest of the four. But that rate is camouflaging something worrisome: the size of the province's labour force is practically stagnant. Between 2011 and 2015, it grew by 0.8 per cent, or 20,200 workers. In Alberta, it went up by 12.3 per cent, in Ontario by 2.4 and in Quebec by 3.1. And the participation rate -- the pool of potential labour -- has been steadily falling, counter to the government's forecast in 2009, when it predicted the rate would continue to rise from the 66.6 per cent set in 2008. Last month, it was 64.1 per cent, lower than it was 35 years ago. In Alberta, it was 72.9 per cent, in Ontario 65.1 and in Quebec 64.5. To take a look at broader economic indicators, it's all RBC Economics and B.C. Stats. Between 2010 and 2014, the provincial economy (GDP) expanded by $34.1 billion. Quebec's economy grew by $50.8 billion, Ontario's by $109.5 billion and Alberta's by $112.3 billion. Since it's not an entirely fair comparison -- as the four economies vary in size and composition -- consider that B.C. 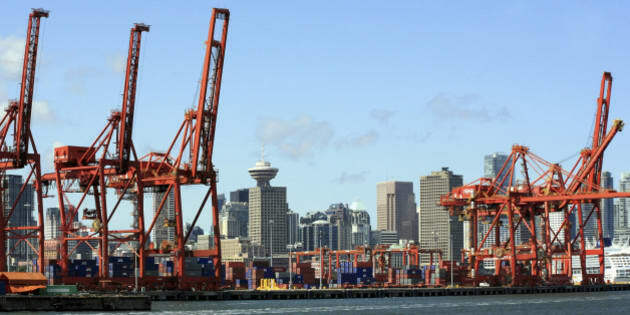 's share of Canada's GDP was 12.6 per cent in 2010 and 12.0 per cent in 2014. The value of B.C. exports in 2010 was $28.64 billion and $35.77 billion in 2014. Not bad, until you learn that it was $34.16 billion in 2005 . In Alberta, the rate was 34.9 per cent, in Ontario 33.6 and in Quebec 27.7. The government's list of potential investments -- valued at $350.1 billion -- reads more like a Christmas wish list than an inventory of shovel-ready projects. Best to let the Business Council of B.C. handle this one: "Digging into the details and reviewing the factors behind some of the biggest proposed projects suggest that the inventory is inflated by a number of projects that ultimately may not proceed." Same could be said for judging B.C. 's economic performance: provincial bests are fine, but the real test is how we perform against others.